The Better Care Reconciliation Act, Senate Republicans’ plan to repeal and replace Obamacare, would if passed lead to one of the largest redistributions of income in American history, just as Obamacare itself did. It would shift hundreds of billions of dollars from health care programs to fund sweeping tax cuts for rich Americans, radically overhaul the way the US supports elderly and disabled people, and allow states to substantially weaken insurance regulations. While it clearly does not yet have the votes it needs to pass the Senate, it could still be tweaked and make it through, and if it does, it will have a strong chance of becoming law. Here’s who stands to gain if that happens, and who stands to lose. Of the 22 million people the Congressional Budget Office projects will lose coverage under the bill, 15 million are currently covered by Medicaid, which the Senate bill would slashed by about $774 billion over 10 years. The cuts will grow even further after the 10 year window is up, because the bill ties Medicaid funding to a slow-growing inflation measure. These are the poorest and most vulnerable people who’ll lose insurance under the bill. In the 31 states (and Washington, DC) that expanded Medicaid following the Affordable Care Act, all adults earning up to 138 percent of the poverty line are eligible for Medicaid. Non-expansion states often feature much lower income thresholds to qualify for Medicaid, particularly for non-parents. The Affordable Care Act’s expansion, where it was adopted, effectively turned Medicaid into a universal insurance guarantee for people in poverty, whereas many people fell between the cracks before. The BCRA would effectively end the Medicaid expansion starting in 2021. Under current law, the federal government initially paid 100 percent of costs of Medicaid expansion beneficiaries, a percentage set to wind down to 90 percent in 2020 and stay at that level permanently. Under the Senate bill, the federal government would gradually wind down that percentage to the states’ normal matching rates for Medicaid — rates that are as low as 50 percent in certain states. The Congressional Budget Office has argued that this will mean no more states pursue expansion. It will also spark states with “trigger laws” — which end the expansion if there’s any reduction in the federal match — to automatically abandon it starting in 2021. Those states are Arkansas, Arizona, Illinois, Indiana, Michigan, New Hampshire, New Mexico, and Washington. Joan Alker, a Medicaid expert at Georgetown University, estimates that those eight states alone could lead to 3.3 million Medicaid enrollees losing coverage. But many of the other 24 states will abandon the expansion due to the lower match rate as well. And keeping it going will be even harder due to other, fundamental changes the bill makes to the Medicaid program. Replacing Medicaid expansion for poor people are new tax credits that are much less generous than those under current law. Under Obamacare, tax credits were tethered to the cost of plans covering 70 percent of medical expenses. The BCRA would reduce that amount to plans that cover 58 percent. That means higher deductibles, copayments, and other means of cost sharing to make up for lower premiums than a more generous plan would have. That’s particularly bad news for the people being kicked off Medicaid, who would get tax credits but would be forced to use them to buy coverage that could cost them thousands of additional dollars per year. Medicaid, by contrast, has minimal or no premiums, deductibles, or copays, depending on the state. It’s true that people in states that didn’t expand Medicaid would get tax credits where they currently get nothing, but the coverage they’d receive would be dramatically inferior compared with if their governors and legislatures had simply adopted the expansion. Moreover, the changes to credits are also bad news for low-income people already on the exchanges, who would get smaller credits for worse coverage. 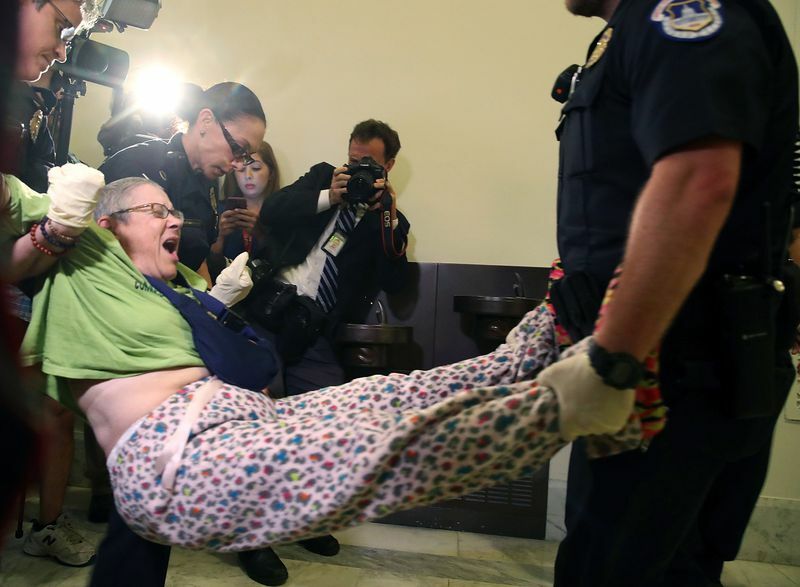 Capitol Police remove a woman participating in a disability rights protest in front of Senate Majority Leader Mitch McConnell’s office. it’s not just people who gained coverage under Obamacare’s Medicaid expansion who would lose out. The law would also adopt a policy known as a “per capita cap” for Medicaid that would hurt all beneficiaries. Currently, the federal government matches state spending on Medicaid, offering about $1 to $2.79 for every dollar states spend on it. Poorer states get a bigger match. But the BCRA would change all that. The AHCA would cap the state match at a set amount of money per person. Until 2025, the amount would grow from year to year according to the medical component of the Consumer Price Index, to account for inflation. Then it would switch to the overall CPI. The medical component of CPI is growing more slowly than Medicaid costs are expected to grow right now, according to the Center on Budget and Policy Priorities, and the CPI as a whole grows far more slowly. So switching to a per capita cap and tying increases to CPI is essentially a federal cut to Medicaid amounting to hundreds of billions over 10 years. In total, the CBO finds that the bill cuts Medicaid by $774 billion over ten years — and by much more over a longer time horizon. A per capita cap is at least somewhat responsive to changes in Medicaid enrollment — unlike a block grant, which gives states a set amount of money, it gives them a set amount of money for every person who’s eligible. But it could lead to cuts in some other ways as well. Take a state like Florida that’s aging fast. The BCRA includes separate caps for different groups of beneficiaries — the elderly, disabled, non-elderly adults, etc. — so states can’t get more money by dumping lots of seniors in favor of 24-year-olds. However, there is still a lot of variation in cost within those categories. “Within your elderly group, you have the young and old, 67-year-olds and 85-year-olds, and the latter are much more expensive,” Georgetown’s Alker told me in March. A state like Florida, which has a large senior population, could see costs rise fast as its population ages with time. But a per capita cap wouldn’t keep up with that. To get around that, the state might be motivated to kick off older seniors and focus enrollment on younger ones. There are some federal requirements as to whom states must cover, but they only go so far, and most states now provide additional coverage that they can roll back. “You do have to cover people on Supplemental Security Income” — a program for disabled, elderly, and blind people with low incomes — ”but a lot of folks in nursing homes [are] optional coverage,” Alker continued. This helps explain why disability rights activists are appalled by the per capita cap plan, and have been aggressively protesting the Senate and House bills; about 50 disabled people, many in wheelchairs, were arrested for protesting outside Senate Majority Leader Mitch McConnell’s office. 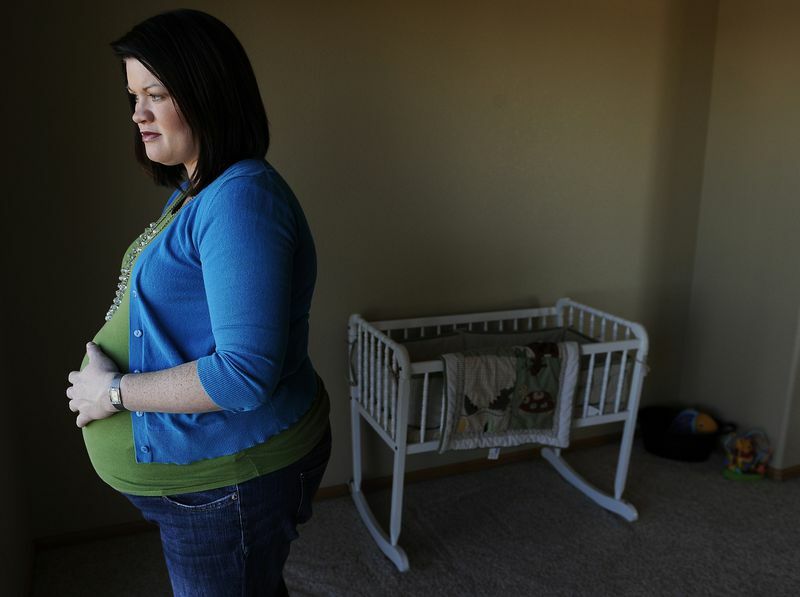 “People with disabilities who rely on home- and community-based services through Medicaid — such as personal-attendant care, skilled nursing, and specialized therapies — could lose access to the services they need in order to live independently and remain in their homes,” the Center for American Progress’s Rebecca Vallas, Katherine Gallagher Robbins, and Jackie Odum note. As if that weren’t enough, the bill has also been changed to allow states to impose work requirements on Medicaid, a policy that would not effectively spur people to work or reduce poverty but that could meaningfully reduce access to care for poor families, and which even many conservative health care experts oppose. The BCRA also allows states to forgo the per capita cap and adopt an even more drastic reform if they want to: a full block grant. States would get a fixed pot of money for Medicaid over a 10-year period, increasing every year only with the normal inflation rate. There would be absolutely no allowance for increased population, or for increased need during recessions. States would be forced to raise taxes or restrict eligibility when federal funds inevitably prove inadequate. Seniors and people with disabilities would be exempted, but would inevitably be hurt as the program itself undergoes cuts. States would no longer be required to cover poor parents. They could charge unlimited premiums, deductibles, and copayments. They could impose enrollment caps and waiting lists, and they could cut the range of services provided to poor children. “Over time, states electing the block grant would be forced to use this flexibility to make increasingly draconian cuts to their Medicaid programs, as the block grant funding cuts became increasingly severe,” Park, Solomon, and Katch write. “This means that plans in the individual market could once again decide not to cover maternity care — like 88 percent of plans did before the Affordable Care Act passed,” as Vox’s Sarah Kliff explains. Poor women (and men, for that matter) who rely on Planned Parenthood for health services are also out of luck. If you rely on a Planned Parenthood clinic for non-abortion services, such as birth control, pregnancy and STD tests, and cancer screenings like breast exams and Pap smears, the Better Care Reconciliation Act affects you as well. For at least one year, Planned Parenthood could no longer receive Medicaid reimbursements, even though it’s already barred from using federal Medicaid money to get abortion services. In more than 100 counties across the country, Planned Parenthood is the only full-service birth control clinic, so denying the organization Medicaid funds would drastically reduce access to contraception and related services for people in those regions. So who gains from all this coverage loss, all the Medicaid cuts, and all these stingier private plans? Mainly, rich people. The Affordable Care Act was financed by a diverse array of tax increases, mostly targeting high earners. The single biggest tax cut included in the bill is the repeal of the 3.8 percent tax the Affordable Care Act applied to capital gains, dividend, and interest income for families with $250,000 or more in income ($125,000 for singles). Repealing that tax is a change that, by definition, only helps the rich, or at least the affluent. If you’re part of a married couple and, like the vast majority of Americans, make less than $250,000 a year, or earn more than that but have little investment income, it doesn’t affect you at all. The Tax Policy Center finds that repealing the tax would amount to an average tax cut of $0 for households in the bottom 90 percent — those making $208,500 or below. A handful of people in the 80th to 95th percentiles would see cuts, but the vast majority wouldn’t. By contrast, members of the top 0.1 percent, who each on average make more than $3.75 million annually, would get an average tax cut of $165,090. Then there’s the 0.9 percent Medicare surtax, a hike on wage income in excess of $250,000 a year ($200,000 for unmarried people). The Republican bill would repeal this surtax and, in so doing, give everyone in the bottom 90 percent an average tax cut of $0, per the Tax Policy Center. The richest of the rich, the top 0.1 percent, would get an average cut of $30,520. JCT estimates AHCA repeal of NIIT & Medicare taxes on high earners still cost $40B/year by 2026. Means this TPC distribution still accurate. But Obamacare did not merely raise taxes on the rich. It raised taxes on a variety of health care–related businesses as well. The biggest hike was a fee on health insurance companies. Which Americans are affected by this fee right now is less clear; insurers have said they’re passing on the cost to consumers in the form of higher premiums, but exactly which premiums are raised and whether insurers actually eat some of it isn’t totally clear. Whether the insurance industry will come out ahead or behind from this bill is a bit unclear. On the one hand, it allows states to loosen regulations that insurers loathe, and includes billions of dollars for insurers to get them to stabilize individual insurance marketplaces. However, there’s a real danger that by repealing the individual mandate, the law will cause a death spiral in the individual market with devastating effects for consumers, insurers, and just about everybody else. But you know who will definitely come out ahead? Medical device manufacturers. These companies, which make things like X-ray and MRI machines and pacemakers (devices sold via retail, like hearing aids, are exempt), have been paying a medical device excise tax as part of Obamacare, and they hate it. Senators from states with large medical device industries, including otherwise liberal members like Elizabeth Warren and Al Franken, have been pushing to repeal the tax for years. If this bill succeeds, they’ll finally see the tax go away for good. So will tanning salons, which have faced a tax on their equipment due to the health risks associated with the practice. The tax served a worthwhile purpose; as many as 400,000 cases of skin cancer every year are caused by tanning, But the industry has been lobbying against the measure since before Obamacare was enacted, and will get a big win should the BCRA pass. Meanwhile, pharmaceuticals will enjoy the repeal of a tax on brand-name drugs. Like the medical device and tanning taxes, it raises a pretty modest amount of money (about $20 billion over 10 years) compared with the taxes on rich individuals, but it’s a major irritant to a powerful industry that the BCRA will quickly eliminate.